XM Studios has been ordered to stop work on X-Men and Fantastic Four dioramas for reasons that it's not "at liberty to disclose." It's hard to imagine Marvel without the Fantastic Four. The company's first superhero team, they're an unarguably integral piece to the puzzle that is the Marvel Universe. You can perhaps understand, in turn, how perplexed some comic fans have been over the company's recent treatment of its most famous family. Back in October 2014, for instance, Marvel confirmed that it would be cancelling its long-running Fantastic Four comic series after issue 645. Now, to add a cherry to that sad sundae, the company may also be making moves to limit the availability of certain types of franchise memorabilia. Case in point, premium collectibles company XM Studios recently confirmed in a Facebook posting that it has, for reasons it's not "at liberty to disclose," been asked to halt all work on a series of planned dioramas based on the Fantastic Four and the X-Men. 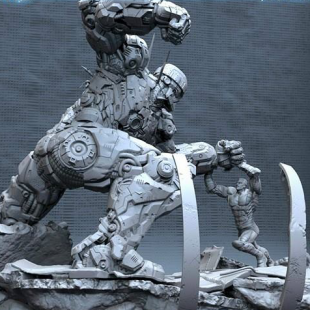 While it's the company's hope "that this isn't an indefinite red light" it means that it can't finish several in-progress sculptures, including a one focused on the Sentinel robots and another based on the time-traveling X-Man Cable. A nearly finished sculpture of the character Phoenix was apparently far enough along to escape the command. While XM Studios hasn't confirmed that the order came from Marvel, we're going to go on a limb to say that there aren't many other places it could have come from. We've reached out to Marvel to seek a comment, just in case. If it was Marvel however, the bigger question is what drove the decision to halt the release of these sculptures. The fact that the order was focused on the Fantastic Four and X-Men could be telling. It's no secret that Marvel remains less than pleased with the fact that the film rights to the two franchises remain under the control of 20th Century Fox. Many fans believe, in fact, that the publisher's cancellation of Fantastic Four was something of a response to the failure of negotiations with Fox over those rights. It might not be ridiculous to suggest that this decision is indicative of Marvel trying to further reduce the presence of properties that it doesn't reap as much fiscal benefit from.